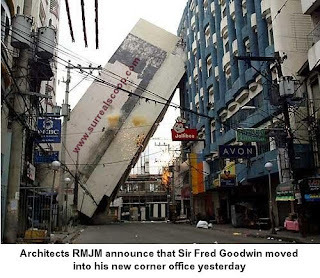 Edinburgh based architects RMJM have announced an ambitious plan to demonstrate to the world the strength of their designs by hiring failed banker Sir Fred “pisstake” Goodwin. Sir Fred rose to fame in 2008 when he successfully overturned established business practice by having neither any banking qualifications nor having to take responsibility for his company’s failed strategy. Sir Fred has been out of work for over a year after leaving the Royal Bank of Scotland in such a hurry that he could smell the flaming torches that the chasing mob of irate shareholders were carrying. It was as CEO at RBS that he oversaw the effective collapse and nationalisation of one of the world’s leading banks. Architects RMJM said whilst the appointment may surprise many it was something that both parties had been moving towards for some time, and the nature of Sir Fred’s responsibilities would become apparent in the future.